Today is the International Day for the Elimination of Violence Against Women or IDEVAW. 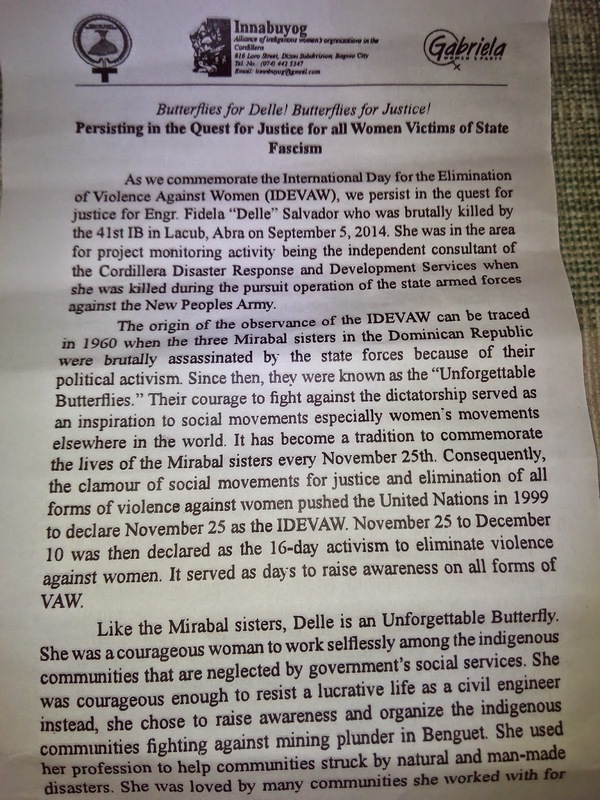 In Baguio City today, 24 November 2014, the Alliance of indigenous women's organization in the Cordillera commemorates the quest for justice for Engr. Fidela "Delle" Salvador who was brutally killed by the 41st IB in Lacub, Abra on 5 September 2014. On 17 December 1999, the United Nations General Assembly designated November 25 as the annual date of the International Day for the Elimination of Violence against Women in commemoration of the death of the three Mirabal sisters in the Dominican Republic. This day also marked the beginning of a 16-day period of Activism against Gender Violence. The end of the 16 days, on 10 December, is noted as International Human Rights Day. The Mirabal Sisters who are also known as Las Mariposas or The Butterflies are the four Dominican sisters who opposed the dictatorship of Rafael Trujillo, three of whom were assassinated on 25 November 1960. Their assassination turned them into "symbols of both popular and feminist resistance". After their assasination, they were then known as the "Unforgettable Butterflies". Patricia Mercedes Mirabal (born on 27 February 1924) was famous for saying "We cannot allow our children to grow up in this corrupt and tyrannical regime, we have to fight against it, and I am willing to give up everything, including my life if necessary". Minerva Argentina Mirabal (born on 12 March 1926) was famous for saying "....it is a source of happiness to do whatever can be done for our country that suffers so many anguishes, it is sad to stay with one's arms crossed..."
Maria Teresa Mirabal (born on 15 October 1935) Maria was famous for saying ".....perhaps what we have most near is death, but that idea does not frighten me, we shall continue to fight for that which is just.."
Like the Mirabal sisters, Engr. Fidela "Delle" Salvador is also an Unforgettable Butterfly who was a courageous woman who worked selflessly in the area of Lacub, Abra for project monitoring activity being the independent consultant of the Cordillera Disaster Response and Development Services and who was killed during the pursuit operation of the state armed forces against the New People's Army. Engr. Salvador, 50 years old, and a mother of three children is a consultant of the Cordillera Disaster Response and Development Services Inc. (CorDisRDS) and the Center for Development Programs in the Cordillera (CDPC). 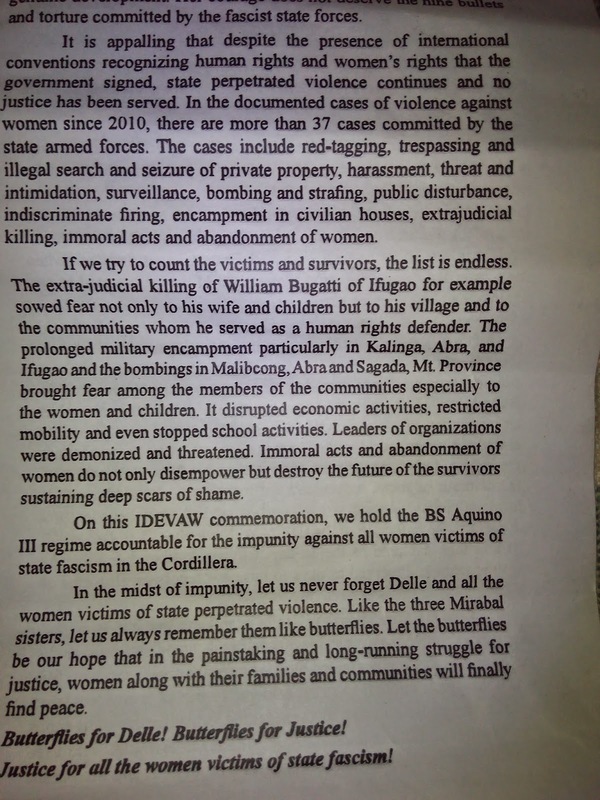 She was on a monitoring visit for various socio-economic projects implemented by CorDiSRDS and CDPC in Lacub, Abra when she was killed by the AFP in their operations. Engr. Fidela B. Salvador is a committed development worker, a Project Consultant, a civilian and a non combatant; and not a member of the New People’s Army (NPA) as claimed by the AFP. On 6 September 2014, Engr. Salvador’s body along with the dead body of another civilian, Lacub resident Noel Viste, was airlifted by the AFP from their Bantugo military camp in Lacub to the Barbarit, Lagangilang, military camp. Attendants of the Pineda Funeral Homes fetched and brought them to the Pineda Funeral Homes in Bangued where her body was identified by the staff of the Cordillera Human Rights Alliance (CHRA) on the evening of 6 September 2014. The killing of Engr. Delle is the latest extra-judicial killing perpetrated against an environmental advocate, specifically a disaster responder. A total of 77 environmental advocates have been killed since 2001, of which 39 killings occurred under the administration of Pres. Noynoy Aquino. With Engr. Delle’s death, there are now seven (7) disaster responders that have been killed under the Aquino government, including humanitarian workers, disaster survivors, and grassroots disaster responders. The autopsy report was released on 18 September 2014. Prior to this, a case conference with Dr. Ronald Bandonill was held on September 15. Here he discussed salient points of his examination of Engr. Fidela’s body. +BLUNT TRAUMATIC INJURY, BACK OF THE HEAD, Contributory+. Nine bullets entered the body of Engr. Fidela. The damage they brought to her vital organs (heart and lungs) might have killed her instantaneously. But the finding that the blunt traumatic injury (comminuted fracture–meaning skull broken into particles) at back of her head as contributory cause of death, and the contusions, massive lacerations, massive hematoma, among the significant findings of the autopsy painted a scenario that directly questioned the validity of the AFP claim that she was killed in an encounter. It pointed to the possibility of torture. An officer of the legal department of PNP-Abra also stated that the 41st IB did not submit a report on Engr. Delle to the SOCO (Scene of the Crime Officer). Yet they had in their possession her ID – a photo of which is posted in their social media page. Justice for Engr. Delle Salvador and all Disaster Responders at Risk!